Note added October 7, 2017: Apple Academic Press has fully addressed the concerns raised in my July 13 post (http://rrresearch.fieldofscience.com/2013/07/apple-academic-press-predatory.html). Their practices now ensure that authors are appropriately consulted and credited when their open-access articles are republished. 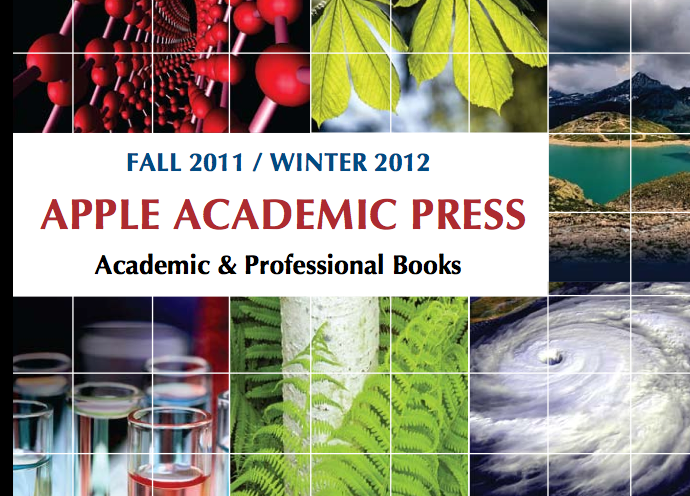 More poking around in the Apple Academic Press 2011-12 catalog, now focusing on the editors. Consider Harold H. Trimm. He's Chair of the Chemistry Dept. at Broome Community College and an adjunct at Binghamton College SUNY, and although Google Scholar finds that he hasn't published a paper since 1986, Amazon lists 9 collections of articles edited by him, all published in 2011 by Apple Academic Press! Even better is A. K. Haghi, who has edited 106 scholarly books for Apple Academic Press in the past few years. Browsing the editors of Apple Academic Press books, a surprising number of them are, like H. H. Trimm, affiliated with Broome Community College and/or Binghamton College. And AK Haghi, usually listed as a Professor of Textile Engineering at the University of Guilan in Iran, has somehow become an Associate Member (sic) of the University of Ottawa and a free-lance science editor in Montreal! And is William Hunter III, who edited four chemistry books with Trimm (as Researcher, National Science Foundation, USA) and three more on his own in the same year, the son of William Hunter Jr, of Olean Hospital, who co-edited a book with Sabine Globig, who edited or co-edited six other books that year? I think we can safely conclude that Apple Academic Press is a shady operation. The next post considers the thorny problem of whether they are an isolated case or the tip of an iceberg. The University of Puerto Rico (Mayaguez) is hosting a website that recruits authors and editors. This seems to be on behalf of Megh Goyal, a retired professor at UPR, who is also the "senior acquisitions editor" for Apple.